The Billboard Music Awards 2016 took place on 22 May 2016 at Las Vegas. And Firstpost gave you the lowdown on the highlights of the evening, as it went down — from Madonna's Prince tribute to Celine Dion's emotional onstage moment. For some artistes who walked the red carpet, their outfits were a chance to make a statement. But what were they trying to say exactly? After a series of shocking outfits, Rihanna surprised us by toning it down for her Billboard appearance. In this coat-style dress, RiRi looked a little, well, drab. On the other end of the spectrum were Z Lala (standing in for Lady gaga we suppose) and Britney Spears (who was making up for Rihanna's lack of skin show). While there were plenty of cute mini-dresses on the red carpet (Mila Kunis and Jessica Alba, we're looking at you!) the floor-length, sweeping train brigade also had plenty of fans. 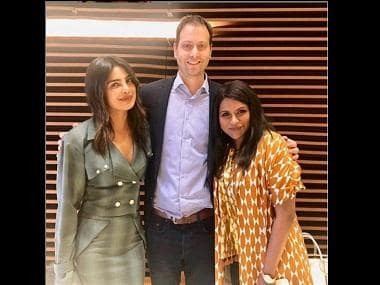 Priyanka Chopra and Orange Is The New Black star Laverne Cox were among those who chose a longer hemline. From Kesha's embellished pair to Steven Tyler's striped ones and Demi Lovato's glamorous choice, we saw versions of trousers that were anything but staid. While the daring look wasn't for everyone to pull off, these stars did get it right with their duds. When it comes to the red carpet, shimmer will never go out of style. 'Shining' with their fashion choices were Ciara, Meghan Trainor and Destiny's Child alum Kelly Rowland.